These are Ideal Replacement Tops for Somma Softside Waterbeds! Note - All waterbed mattress tops on this page do not include waterbed tubes. You may use your own tubes or purchase tubes from our great selection! These somma "top only" replacements feature a unique, sturdy foam perimeter with a lifetime guarantee. Our "sling rail design" provides maximum edge support, and ensures many years of solid, sturdy support. 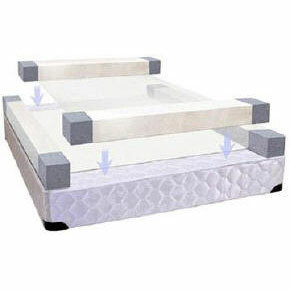 The zipper cover surrounds the foam perimeter which also adds to the stability of the mattress top. The liner (which will prevent any leaking) and tubes are placed inside the foam perimeter. Once in place just zip everything together and your bed is ready.